It’s time for Annabelle’s virtual book tour! I think it’s so cool that in the age of the Internet we can do a book tour over the web instead of physically in stores! The first stop on our book tour is Vixie’s Stories where Annabelle wrote a guest post Why I Wrote The Boy Next Door. It’s got one of her signature graphics, too. So much fun! As my finger brushes against the slight stubble on his chin, I can’t help but feel like if Melissa were seeing this, she wouldn’t be too happy. “You shouldn’t worry about Melissa,” he says, as if reading my mind. “I just don’t want to lose you,” I say. “Come on, you’re never going to lose me,” Jason says. And I think that he believes it, but I’m not so sure. I think before Melissa will commit to him, there’s going to be an ultimatum, and it’s going to include my name. Pick up the book at Amazon! Also available at any of the international Amazon sites. 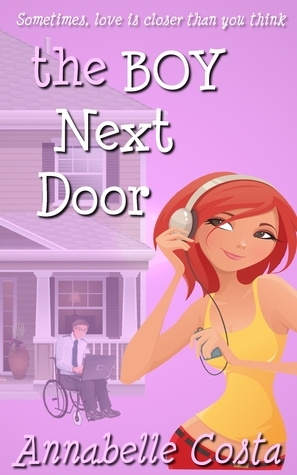 The Boy Next Door is Here! We are thrilled to announce the launch of Annabelle Costa’s The Boy Next Door, the sweet and romantic tale of a sassy girl who doesn’t understand love nearly as much as she thinks she does.